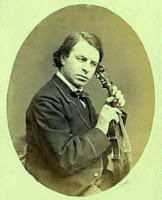 Joseph Joachim was a Hungarian violinist, teacher, conductor, and composer born on June 28, 1831 (Mendelssohn was 22 years old.) Because he was associated with so many important musicians (and pupils) during his lifetime, he is still regarded as one of the most influential violinists of all time. One of his early teachers was Stanislaus Serwaczynski, concertmaster of the opera orchestra in Pest, who also taught Henri Wieniawski. At age 8, he began studies at the Vienna Conservatory where he studied with Joseph Bohm, among others. After studying in Leipzig for a while, he made his London debut with the Beethoven violin concerto in 1844 (at age 13) which concert Mendelssohn conducted. Returning to Leipzig, he became assistant concertmaster of the Gewandhaus Orchestra - Ferdinand David was concertmaster. He was most likely playing in the orchestra when David premiered the Mendelssohn concerto on March 13, 1845. In 1848, he left Leipzig to join Franz Lizst in his new music endeavors (and his Weimar orchestra), serving as concertmaster. In 1852 (at age 21), he left Weimar (and Liszt’s New German School ideals) to work in Hanover (as concertmaster of the Hanover Court Orchestra), rejoining the old guard, which included Robert Schumann, Clara Schumann, and Brahms. Fourteen years later, in 1866, Joachim moved to Berlin, where he founded the Royal Academy of Music and, in 1869, the Joachim String Quartet. He left the Hanover orchestra (at age 35) over a dispute concerning another player, Jacob Grun. On January 1, 1879, he premiered the Brahms concerto in Leipzig, with the composer conducting. On the same program was the Beethoven concerto. On January 13, 1883, he made his debut with the Berlin Philharmonic, again playing the Beethoven concerto. He was 51 years old. One source states that Joachim made his debut with the Berlin Philharmonic on March 17, 1899. That is probably quite incorrect because Joachim would have been 67 years old by then. Brahms himself related how, after Joachim played his concerto in Vienna on January 14, 1879, the audience applauded right after Joachim finished the cadenza. The same thing happened years later (1896) when Bronislaw Huberman played it in Vienna - Brahms was again present at that performance. It was probably a coincidence. In 1903 (at age 72), he became one of the first violinists to record. Joachim composed a number of works (including 3 violin concertos) which today remain obscure. His best known work is probably the Hungarian concerto in d minor. Though he inspired at least two concertos in the standard violin repertory – the Dvorak and the Schumann – he never played them in public. Thanks partly to his criticism of the work, the Schumann concerto (written in 1853) was not premiered until 1937. A number of cadenzas which he composed for several violin concertos are still in use. Joachim died on August 15, 1907, at age 76. Heifetz was about six years old. Among Joachim's many pupils is Max Pilzer. It has been said that Efrem Zimbalist and David Oistrakh once sat down to listen to some Joachim recordings and were disappointed by what they heard. It is understandable since Joachim was quite elderly when those recordings were made. The same can be said of Sarasate's and Ysaye's recordings. We can only guess as to how Paganini, Rode, Lipinski, Viotti, Vieuxtemps, Wieniawski, and so many others sounded.